Hello! I just love this set by Hero Arts called Frightful! Isn't that tree just awesome, and the little ghost is so CUTE! I stamped my images with Memento Tuxedo Black ink and shaded the ghost with warm gray Copics. I cut out the images and layered them on top of a circle that I sponged with PTI Summer Sunrise ink. 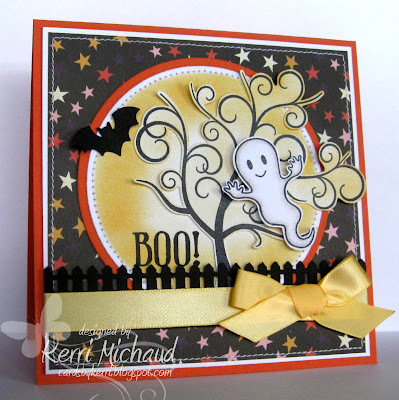 I added a fence that I punched with the Martha Stewart Picket Fence Edge Punch, and stamped the BOO! which is 1 of 3 sentiments that comes with this set. I added some stitching and a punched bat and it was complete! You can pick up this set for 10% off MSRP and get FREE SHIPPING at ABC Toys and Crafts! Check out the weekly specials~20% off Stampavie Stamps and 40% off all KI Memories Clear Stamps! That's a wonderful card....colors are fantastic. Don't yea just love halloween colors! Love the stamp set....it's got a hint of daintiness to the scariness it's supposed to be!! LOVE this girlie!!! This ghost is SUPER cute and I LOVE LOVE LOVE all the stitching and papers!! SO CUTE!!! I love all the little details and that ghost is adorable! What a cute halloween card Kerri, beautiful! Kerri I love this card. Fab colors too. Sending hugs! Love everything about your card. The images are super cute and that fence is the perfect touch. FAB!!! Oh WOW Kerri...this is just ridiculously AWESOME!! Love the stitching, colors, those images...EVERYTHING! !